If you follow me on Facebook or Instagram you have probably seen my posts about the book Unbroken over the last week. I started the book last week and finished it Monday night. I loved the book Unbroken! Unbroken has been in my to read pile for several years. I have had heard great things about it, but did not get around to reading it until this last week. I loved it. It is a hard story to read simply because of the reality of what happened, but it was so good. I had trouble putting the book down to get anything done. Most of the time I made myself wait until the evening to start reading because I knew if I started reading it, I would not put it down to get what I needed to do done. It is an amazing story of survival and forgiveness. It is going to go on my list of must reads for high school home school reading for my kids. It was that good. I have read 46 books so far in 2015 and it was my favorite book this year. If I had to make a list of my top 10 books that I have ever read, I think this one would make the list. If you have not read Unbroken: A World War II Story of Survival, Resilience, and Redemption and enjoy non-fiction history type books, I highly recommend it. If you have read it I would love to hear your thoughts. Now let’s talk ebooks vs print books. Over the last few years I have read a lot of books both in ebook form and print form. I love them both, but the more ebooks I read, the more I find myself preferring books in print. In 2014 I read 40 books and at least half were ebooks. Of the 46 books I read in 2015 only about 12 were ebooks. In 2014 I definetly loved ebooks. In 2015 I found myself really preferring print books. I still love ebooks for waiting at doctor’s appointments, reading in the car, traveling, etc., but when I am at home or other times where it is easy to take a regular book, I prefer a real book over an ebook. Ebooks definitely help me read more because I always have a book with me. Over the last few years I would not have been able to read 40+ books a year if I did not read ebooks. I love them and see the value in them, but I think I will always prefer a good old fashioned print book. How about you? Do you prefer ebooks or print books? Which one do you read the most? 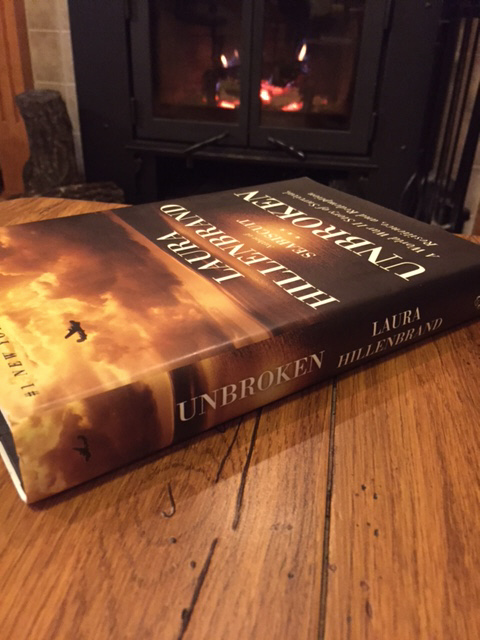 I loved unbroken, the book and I have it in all three formats, ebook, hard cover and audio. The movie was okay, but not nearly as good as the book. Oh yes I have the movie as well lol. I love my ereader for traveling, but I too prefer a real solid book at home. I bought my husband the audio book for Unbroken so he could listen to it on his way to and from work, etc. After he listens to it I want to see the movie. I have heard mixed things about the movie, but I figure it is like most movies based on books, the book is almost always better. 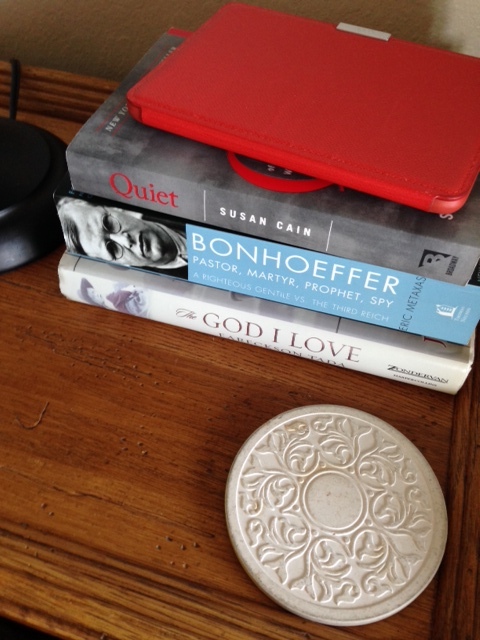 I see Bonhoeffer in the stack. The Cost of Discipleship is a great one! I, too, prefer an actual hold-in-my-hand, turn the page, dog-ear if I want book. I loved the Bonhoeffer book! It is also on my list of favorite books! Unbroken was the first ebook I ever read and the only book my husband and I have both read. He prefers non-fiction and I prefer fiction, but we both love history and we both loved this book! I much prefer ebooks a over real books. Real books are heavier and take up so much more room to store. I have my kindle with me most of the time and I love having my whole library with me in such a small package. Plus, it is much easier to read at night on my kindle-no light needed! The only paperback books I read this year were ones I read with my kids. My paperwhite is one of my favorite things!! I have heard a lot of people say that they love their Kindle for reading at night. This year I have been reading ebooks mainly on my phone because I read my ebooks when I am out of the house and always have my phone with me, but I have a Kindle. Maybe I need to give the Kindle a try again and see if I like ebooks more again. Due to your recommendation, I just put it on hold at my library. I think my son and I may read this together – maybe as a read aloud. We both are avid readers and love history. Thanks for sharing. I like ebooks for convenience and price, but I see a lot more errors in them than in print books. Often they are not proofread very well. I like being able to adjust the size of the text. My eyes are getting older, and sometimes I have trouble reading small print. I don’t have room to store a lot of print books, so ebooks are a better way for me to add to my library. I haven’t read “Unbroken” yet, but it sounds interesting. I almost always like books better than the movies based on them, so I watch movies without high expectations and am sometimes pleasantly surprised if they follow the book fairly closely. I have the Kindle app on my computer and my Ipad. I never have gotten in the habit of using it. I have too many print books in my stack! Even if I get into using an ereader, I’m certain I prefer print books. I got used to ebooks, and I love them for the convenience. There are some great bargains in that version of a book, but lately, the publishers are pricing ebooks and the print editions within a couple dollars of each other. In that instance, I go for the printed version. It doesn’t make sense to spend a that money for a digital copy. Most of the ebooks I have are ones I have gotten really cheap. I agree with if it is only a couple of dollars more I would much rather have a print copy. I’m fine with ebooks for pleasure but if I have to read to study for work school etc. I want a hold in my hands book! I prefer printed books, but I do read on my kindle sporadically – usually because I can’t find a book at the library but I can borrow the ebook or it’s a super low price. I do like having something on the kindle to pick up here or there, and it was useful on vacation this fall to have a book queued up on my kindle for night time reading. I have had Unbroken on my to read list forever – I need to read it this coming year! Did you read Boys on the Boat – I really enjoyed that one. I know you do non fiction, but A Man Called Ove was my very favorite fiction read this year. so charming and different. My daughter and father in-law both read and really enjoyed Boys on the Boat, so it is on my to read list for this year. I have not heard of a Man Called Ove, but will have to look at it. Thanks for the recommendation. I read mainly non-fiction, but do read a few fiction books. Thanks! Hey folks, those of you who have ereaders, you can go to Bookbub.com and register, and they will send you a daily email listing low priced books and even some free ones.